“The Vaccine Safety Handbook” looks legitimate but is filled with wild conspiracy theories and inaccurate data. As New York officials declared a public health emergency in parts of Brooklyn this week, establishing mandatory vaccinations in an effort to stop the city’s worst measles outbreak in almost 30 years, health advocates pointed to what they believe is a major source of vaccine misinformation in the affected neighborhoods. The false messages that they say convinced hundreds of New Yorkers not to vaccinate their children weren’t spread in a Facebook group or on YouTube, but through a glossy magazine written by and for Orthodox Jewish parents. Copies of the magazine were shared in a way that seems old-fashioned in the age of misinformation — through family, friends and neighbors. “The Vaccine Safety Handbook” looks legitimate but is filled with wild conspiracy theories and inaccurate data. Published by an anonymously led group called Parents Educating and Advocating for Children’s Health, or PEACH, the handbook disputes the well-established dangers of illnesses like measles and polio, challenges the effectiveness of vaccines in eradicating those illnesses, and likens the U.S. government's promotion of vaccines to the medical atrocities of Nazi Germany. Inside its 40 pages, between cartoons mocking the medical establishment, PEACH’s magazine inaccurately suggests vaccines are made up of “toxins.” Without evidence, it claims that vaccines are the nation’s greatest threat to public health, linked to autism, ADHD, Sudden Infant Death Syndrome, miscarriage and other maladies. Yet according to New York State's Department of State and internet domain registration records, PEACH appears to be linked both to a decade-old misinformation hotline targeting the Orthodox community and to Enriched Parenting, a website that peddles new-age cures from a Jewish perspective alongside vaccine hoaxes. Enriched Parenting’s website features retouched photos of children picking flowers in fields of lavender alongside articles that explain how concern over the measles outbreak is overblown. There are articles about how to beat back-to-school blues and treat urinary tract infections with herbs. There is also a forum where members trade sourdough recipes and alternative cancer treatments. It’s not just trendy, it’s effective. Research shows combining vaccine misinformation with alternative medicine, homeopathy and diet content this way is one of the most pervasive and persuasive techniques used by anti-vaccination advocates to forward their agenda. In 2017, members of Pittsburgh’s Orthodox Jewish community — which has largely embraced vaccinations — complained on Facebook that PEACH was targeting their neighborhoods by mailing out unsolicited copies of the handbook. Since the start of the New York measles outbreak in October, 285 cases have been confirmed in the city, most of them unvaccinated or partially vaccinated children, resulting in 21 hospitalizations and five admissions to the intensive care unit. 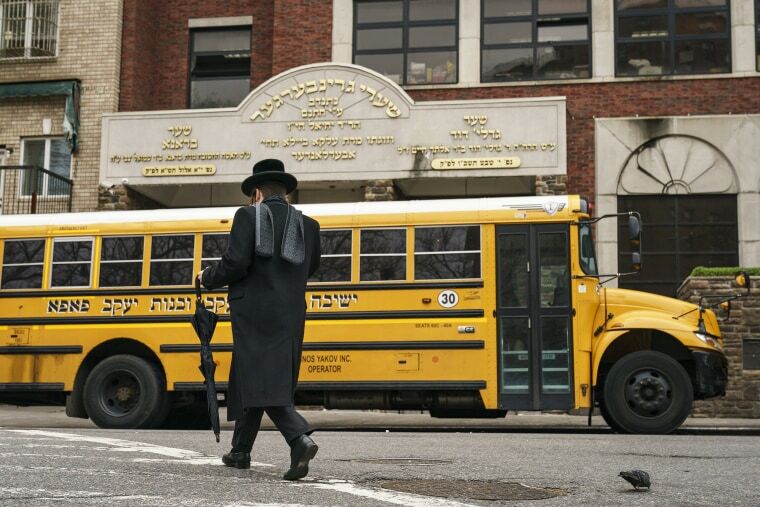 This outbreak, like others last year in New York and New Jersey, spread within Orthodox Jewish communities. For a decade, through the Akeres Habayis Hotline, a recorded-message center for Orthodox Jewish women, PEACH has been spreading unfounded fears about vaccines in the Orthodox community and helping skeptical parents avoid them. Chany Silber, 41, has been moderating the conference calls since at least 2011, according to advertisements in Jewish magazines. In 2014, according to internet registration records, Silber bought the domain name PeachMoms.org — a website that never appears to have gotten past the “coming soon” phase. Silber declined an interview when the website Gothamist rang her doorbell last month, but claimed that the Centers for Disease Control and Prevention “says a lot of fake things,” Gothamist reported. Silber did not respond to an email and text message requesting comment, and a woman coming out of Silber’s apartment Thursday ignored questions from an NBC News reporter. There are several connections between PEACH and Enriched Parenting in online and public records. PEACH is registered as a nonprofit group with New York State’s Department of State. In those state records, PEACH lists Enriched Parenting, which describes itself as dedicated to “informing parents on how to promote their children's lifelong physical and emotional well-being,” as its website. In the past, “donate” links from the Enriched Parenting site, accessed by the Internet Archive’s “Wayback Machine,” led donors to a PEACH donation page. And the website enrichedparenting.org was registered in 2015 under the email address of founder and current president Rebecca Fleischmann, and lists as its organization’s name Parents Educating and Advocating for Children’s Health, according to historical internet domain records. Calls and emails to Enriched Parenting and to Fleischmann were not returned. In a text from the phone number listed on Enriched Parenting’s website, a person who declined to be identified denied any association with the handbook. Asked about the numerous associations, another reply came via text. From 2015 until the fall of 2018 — about the beginning of the current measles outbreak — Enriched Parenting’s website had a large section on its homepage dedicated to vaccines, according to historical internet records. The entire vertical, which included dozens of articles and links to resources and research that pushed vaccine misinformation, was removed when the group rebranded and relaunched the website sometime after last August. The rebrand came with a flashy new website, a revamped social media presence, and a less in-your-face method to anti-vaccination advocacy. Enriched Parenting seems to aspire to be a lifestyle brand. Through Enriched Parenting, Fleischmann has hosted events featuring holistic health practitioners such as Long Island pediatrician Lawrence Palevsky, a star in the anti-vaccine world who has appeared in at least one anti-vaccine documentary, and Dr. Leonard Kundel, a dentist with disciplinary records in Connecticut and New York after being accused of improperly treating a patient in 2011, who practices a “whole body approach” to dentistry. Kundel is Fleischmann’s personal family dentist, according to her Instagram account, and keeps an “Enriched Parenting library” full of almost exclusively anti-vaccination books in his waiting room. Other events included a “Spa Night for the Body, Mind & Soul,” which featured a homeopath who promotes herbal cures for depression and anxiety. Recently, the group has organized smaller group sessions for local chapters across six states with monthly themes like "Bloom Where You Are Planted." Enriched Parenting’s Facebook page has over 1,900 followers. And its reach stretches beyond the Orthodox community, with its president and a partner contributing articles and posts in 162,000-member Stop Mandatory Vaccination, Facebook’s largest and most active private anti-vaccination group. Moishe Kahan, 47, of Brooklyn, listed as a contributing editor in PEACH’s handbook, often posts to Enriched Parenting’s Facebook page. Along with helping administer Enriched Parenting’s page, Kahan also runs the group Jews and Vaccines, previously named Jewish Vaccine Skeptics. He did not immediately respond to emailed questions. Rothstein, who currently leads PEACH conference calls on the Akeres Habayis Hotline, is licensed to practice in Pennsylvania, but he’s under probation by the medical board. The article was removed from the website Wednesday after an inquiry from NBC News. Enriched Parenting’s YouTube channel and Instagram profile are still filled with anti-vaccination content. The current mailing address listed on Enriched Parenting’s website is home to two school bus companies. Workers there told a reporter they had never heard of Enriched Parenting. Brandy Zadrozny is an investigative reporter for NBC News.